The glowing, apricot-yellow flower spikes of Kniphofia ‘Tetbury Torch’ are putting on a dazzling display in this sunny area of the garden. 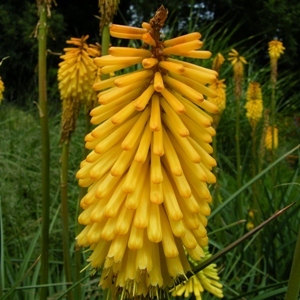 Whilst Kniphofia flowers are naturally pollinated by nectar-drinking sunbirds in South Africa, similar attempts by bees in the UK can occasionally result in them getting stuck inside the tubular petals! Also known as red hot pokers or torch lilies, these are fantastic plants for adding vertical structure to a summer border, and for providing vibrant splashes of colour. Grow in soil that doesn’t dry out in summer to match their native environment of moist places in the uplands areas.